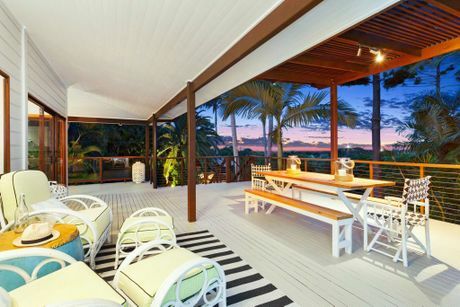 BYRON Bay television personality Shelley Craft said she is hooked on renovating homes and her latest Ewingsdale creation is now up for sale. The co-host of Channel Nine's The Block jokingly blamed the TV show for her catching the renovation "bug". "I don't think we can look at a house now without thinking about what we could do to renovate and improve - I'll blame The Block for that," she laughed. "Renovating is in my blood now." Craft and husband Christian Sergiacomi were married at Belongil and first rented at Coopers Shoot before buying their Ewingsdale property four years ago, where they have been raising their two girls, aged two and four. 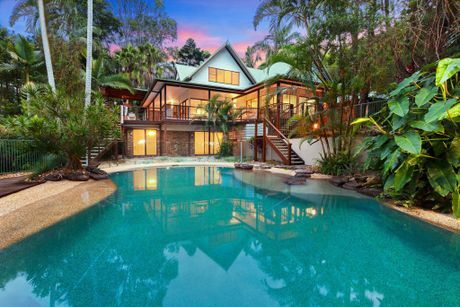 Known as The Rise, the three-storey, five-bedroom home is being marketed by Byron Bay Property Sales and is set in a private dress circle location on 6107sq m of tropical rainforest. The home has a resort-style pool and views to Julian Rocks and Cape Byron. The house didn't need any structural work, Craft said, but has been updated for modern family living. "We extended the outdoor living with new decking and a gazebo, while inside we painted, added new carpets and updated the look of the home," she said. Renovations didn't start on the property until this year after they had lived in the home for some time, she said. "I was eight months pregnant with my first baby when we moved in, so I wasn't up for any major renovations to start with," she said. "And I think it's important to live in a house for a while first to see what you need to change." Craft will stay in the Northern Rivers when the home sells, having purchased acreage at St Helena so her girls can enjoy their latest interest - ponies. "We will really miss this home but we are entering a different stage of our lives now as the girls get older," she said.